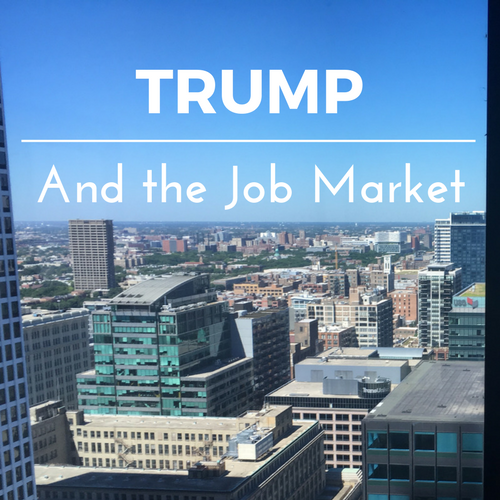 SURVEY: Job Seekers Unsure About Trump's Impact on the Job Market | Challenger, Gray & Christmas, Inc. According to survey results released Wednesday by global outplacement consultancy Challenger, Gray & Christmas, Inc., 53 percent of respondents said they were not sure if the incoming president will benefit job seekers. The survey was conducted last month among callers to a two-day free job-search advice hotline organized by Challenger to help job seekers during the holidays. 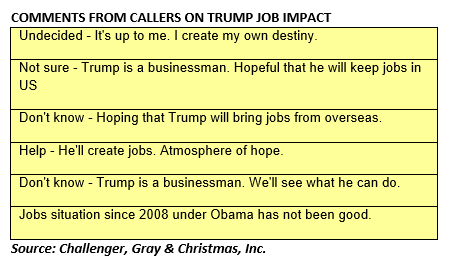 While more than half of the callers were unsure of how a Trump administration would aid their efforts, nearly 30 percent were positive that the new president will benefit job seekers. About 18 percent felt that the new administration will be of no benefit. “Whether the issue is jobs, health care, taxes or business regulations, there remain many uncertainties when it comes to the incoming administration. President-elect Trump has provided many clues in the form of tweets and spur-of-the-moment remarks to the media. However, it remains entirely unclear as to which of these talking points will actually become policy,” said John A. Challenger, chief executive officer of Challenger, Gray & Christmas. “Certainly, job seekers might have gained some confidence in a Trump administration after he stepped in and pressured Carrier and Ford to keep jobs here in America. However, the reality is that once Trump becomes president, he cannot simply go from company to company saving jobs. Most job seekers understand this and remain unsure about how the presidency will ultimately impact their lives,” he added. “Since we don’t know which policies Trump will push or whether those policies will be enacted through the legislative process, it is impossible to say what the long-term impact of a Trump administration will be on employment and the job market. The good news is that the economy has strong momentum heading into the next six to 12 months. Unemployment continues to fall, with both payrolls and wages increasing,” said Challenger. “Job seekers should be confident about their odds of success in the near future. It is a seller’s market, with employers in some metropolitan area trying to find talent in a labor pool with less than three percent unemployment. Job seekers with the right skills and experience will succeed in this market, regardless of who is in the White House,” he concluded.